Candy is one of the leading European companies in the sector of large free-standing and built-in appliances with a firm foohold in the middle range of the market. For over 70 years, Candy products have combined innovation and user-friendliness to meet consumers’ requirements and improve their quality of life. Based on its long experience, studded with innovations and success stories, Candy has developed simply-Fi, the first complete range of domestic appliances to rely on a Wi-Fi connection ensuring easier management, even from a distance. The range offers a variety of smart products for washing, cooking and storage in all-Italian style. Being smart means thinking outside the box to create smart solutions and meet our customers’ day-to-day requirements. The smartness of Candy derives from the large portfolio of skills in creating products that are easy to use and simplify the everyday lives of consumers. For Candy, focusing on the consumer means understanding what makes them tick. This is why the requirements of its users are key to the development of its products. Italianness is not only about aesthetics and design, nor is it only a valuable asset when talking about art, cooking and fashion. For Candy, Italian style is also way of approaching life and and knowing how to enjoy what it has to offer. Candy has always been a pioneer when it comes to promoting innovation in the global washing market. It produced the first all-Italian washing machine in 1945 and was responsible for inventing the “modern” front loading version in the late fifties, setting the European standard which is still in force today. Continuing along its journey, the Group drew strength from the experience it had gained in washing to acquire important market shares in strategic market segments and accelerate a profitable growth. 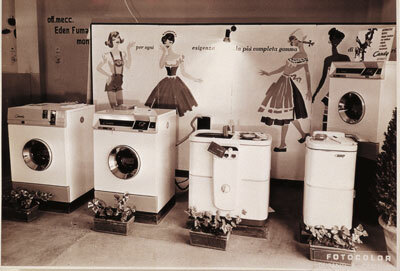 The first Italian washing machine was the Model 50, launched in 1945. It began as a true industrial project launched by Officine Meccaniche Eden Fumagalli thanks to the intuition of Eden Fumagalli, the technical genius of his son Niso, the far-sightedness of his second son Enzo and the managerial and organisational prowess of his third son Peppino. Domestic appliances were a new revolutionary concept for post-war Italy and they became an instant success because they met the real requirements of Italian families. The name Candy was inspired by an American song; a sweet sound that evokes the whiteness of perfectly washed laundry. For Candy, washing machines had to wash clothes effectively, be sold at a fair price and look good. Not to mention accommodate the newest advances made by technology. Candy immediately began its quest to continuously improve the quality and performances of its products, focusing on technology and functional design. In this way it made its mark on the evolution of the washing machine in Italy and, in the late fifties, it set the European standard still in use today, with the Automatic, the first fully automatic washing machine with front porthole door and horizontal drum. In 1961, Candy moved to Brugherio in the new management offices next to the company’s research and development laboratories, plant and spare parts warehouse. Between 1965 and 1975, it began to diversify its production, devising new products and introducing Stipomatic, the first dishwasher. The task of enhancing the aesthetics of its products was entrusted to the most prestigious designers of the period. And thanks to the acquisitions of other important brands, it completed its range of large domestic appliances by adding products in the cooling and cooking segments. From 1975 to 1985, the range continued expanding. Technology, innovation, functionality and aesthetics remained the basis of all new Candy domestic appliances. The built-in ranges were also introduced. TRIO was launched, a dishwasher, oven and hob combo that fitted into a width of 60 cm. In the 1980s, the first electronically controlled products were presented, in particular washing machine and dishwashers. The 1990s were characterised by the expansion of the business on the international market, with the integration of important national and international brands that left their mark on the history of domestic appliances in many countries. In the new millennium, Candy continued to grow: by 2002, it was exporting its products in a total of 111 countries. The expansion continued, in industrial terms too, with plants opening in Russia, Turkey and China. 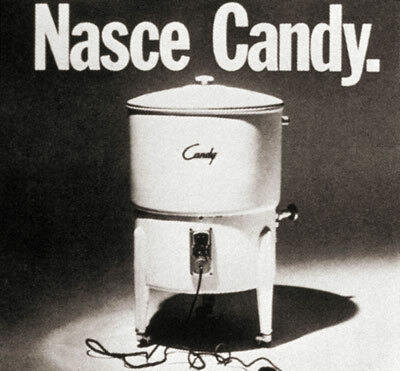 Candy continued launching innovations with its 15-place-setting dishwasher, the DUO, the first built-in domestic appliance to combine dishwasher and electronic multi-function oven in standard sizes and EasyCase: a tank that collects condensation in the back of the porthole door: a revolution for washer-dryer-technology. In 2014, simply-Fi was presented, the first full range of Wi-Fi connected domestic appliances, complete with remote control. In 2017 Candy launched Watch&Touch, the first fully touch-controlled smart oven with Total Control Screen door, winner of the Red Dot Award, and Bianca, the first washing machine equipped with intuitive voice control . Today Candy is the fruit of a long experience, continuous innovations, brand new concepts and successes. Candy products are characterised by a greater level of comfort and smart functional innovation; they are designed to cater for traditional consumers, interested in highly reliable quality domestic appliances with a particular focus on combining design and functionality to simplify and improve the quality of life.